Manda: I DID have soup! It was delicious. 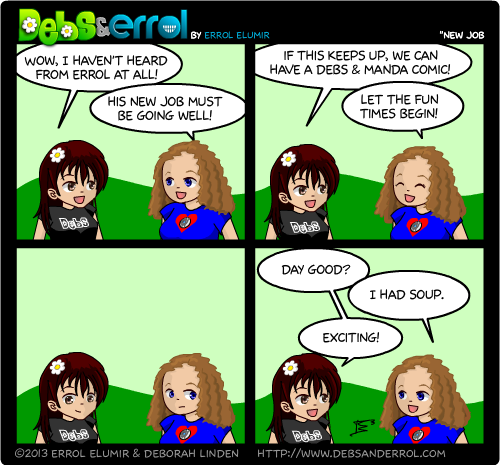 Debs: I want soup! Ja-Mez just asked if I needed anything form the store and I asked him for an onion for my belt, which was the style at the time and can also be used to make soup. Manda: It CAN! OH, glorious onions, you make all the soups delicious but you’re awful to chop up. I don’t think there’s a soup without onion…wait, i have dessert soups in my recipe book, never mind :D. I could go on and on about soup. This is what happens when Errol leaves. The king is dead! Long live the soup! We always have soup at my house. It’s awesome. 😀 I love soup! I can dice an onion like nobodies business. I’m all chop-chop-chop and vwoosh, diced onion, there you go. And now i have eaten my soup again. I made enough for ten people. That is a lot of soup for one person to consume. Go cheap! What kind of soup did you make, Manda? I still haven’t made any yet because I have a pot of chili in the fridge and I don’t want to squish two bigs things in there at once. I made corn chowder. It’s awesome! I can make enough soup for ten people! (Or something…) Unfortunately we never have more than three to consume it all… anyway yeah, Go cheap. Y’like your new job, Errol? This…is the most soup talk I think I have ever heard in my life. Tomorrow, we can talk about nuts. I had beef stew from a can.. that’s pretty soupish..
Actually, my mom makes soup without onions because I’m allergic. She keeps saying she is going to teach me, but it just never happens. Le sigh. There’s a tomato vegetable soup my mom taught me how to make when I was 13, I think, that I made so often that it came to be known as “Debbie’s soup”. I still make it and it’s tons of yum. Other than that, I never liked getting into the kitchen to learn things. I didn’t either… until my mom stopped cooking as much. I miss the dishes enough to be willing to learn how to make them. Maybe about to head out. But baby and I spent to day watching Totoro and Kiki. And now my grandmother likes Miyazaki. Wait, you call your grandmother ‘baby’? Lol, no, watching the baby is a multi-generational activity. My folks were out running an errand, leaving Grandma and I to see to the little bit. She’s 2 years old, and loves Swahili music, and now Totoro.